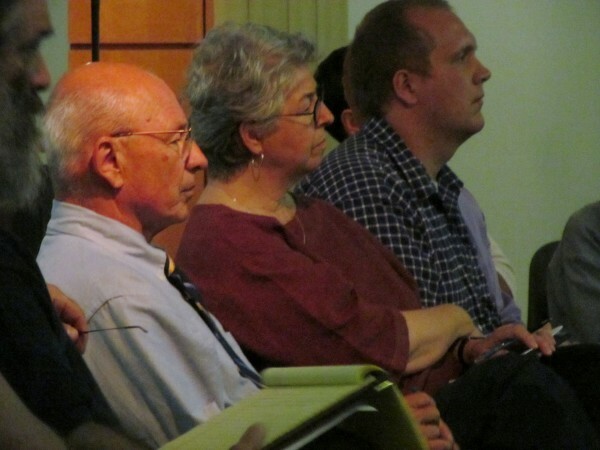 Portland Mayor Michael Brennan and Anna Eleanor Roosevelt, head of Goodwill Industries of Northern New England, listen as members of the public weigh in on a proposal to raise the minimum wage in this August 2014 file photo. PORTLAND, Maine — Efforts to enact minimum or “livable” wage ordinances in the city will progress next month and possibly Nov. 3. A bill that would have banned municipalities from setting their own minimum wages failed in the Maine House Monday by a 83-60 vote. The bill, requested by Gov. Paul LePage, passed in the state Senate 20-15 on June 18. The Senate vote came a day before members of the Maine Green Independent Party presented more than 3,000 signatures to City Clerk Katherine Jones in support of a citizen initiative to create a $15-per-hour minimum wage by 2019. On July 6, the City Council will hold a hearing and is expected to vote on an ordinance to create a citywide minimum wage of $8.75 per hour on Jan. 1, 2016. The wage would increase by 50 cents an hour on Jan. 1, 2018, and Jan. 1, 2020. The current state minimum wage is $7.50 per hour. A bill to increase the state minimum wage to $8 per hour, introduced by Rep. Dillon Bates, D-Westbrook, has not been passed by the Legislature, where the House and Senate have disagreed on amendments. The ordinance coming to the City Council July 6 would include all private and municipal workers, but sets a wage lower than one sought by Mayor Michael Brennan. When introduced to the Council Finance Committee by Brennan, the ordinance sought to increase the minimum wage to $9.50 per hour by Jan. 1, 2016, with annual increases to $10.10 per hour and $10.68 per hour. Brennan had envisioned a minimum wage approaching 50 percent to 60 percent of the city median wage, estimated at $17 per hour. If passed, the citizen initiative for the livable wage would not include municipal workers, but could not be amended for five years. The wage increase would become effective July 1, 2017, for companies with at least 500 employees, including local franchises of national companies. Companies with fewer than 500 employees would be required to pay $15 per hour by July 1, 2019, with increases to $12 and $13.50 per hour required in the two years before that. Once the signatures are certified by the City Clerk, the petition will be sent to the City Council for a public hearing. It could be enacted by council vote or placed on the November ballot.